Hiring a crazy golf course is the new trend to sweep the country. 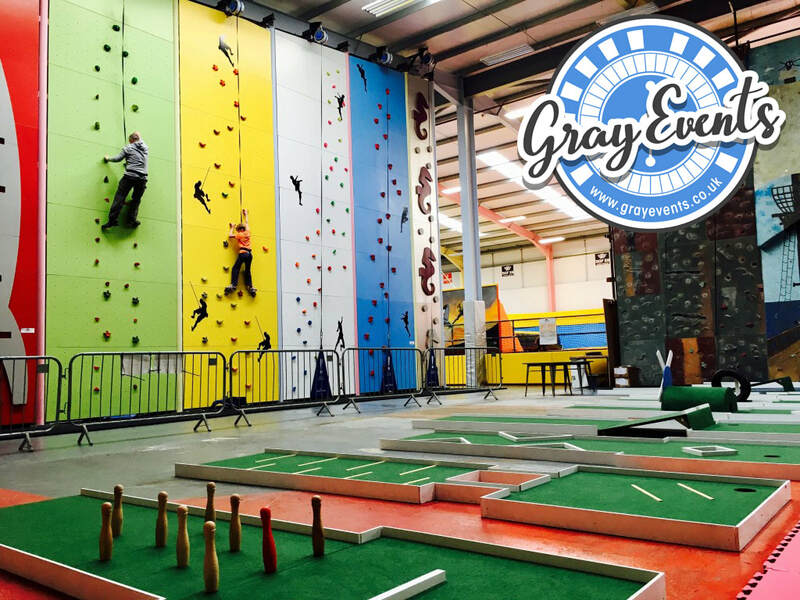 At Gray Events, we’ve created the brand new, nine hole mini golf hire, ready to leave your guests with unforgettable memories of your event. This is garden games hire at its finest. Family events, wedding receptions and parties will never be the same again - especially if you hit below par with our event entertainment. There are few other activities as exciting and memorable as this, and our portable crazy golf is available for every possible event. 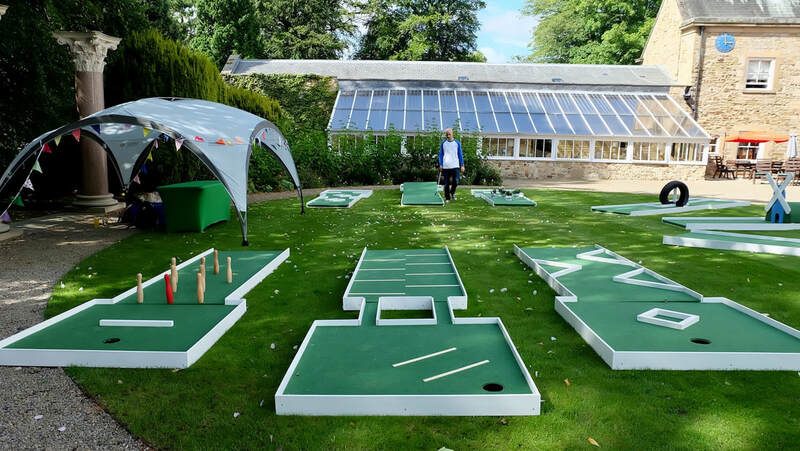 Whether your party or wedding is indoor, or outdoor, we can arrange our mobile crazy golf for that authentic golfing experience at your event. 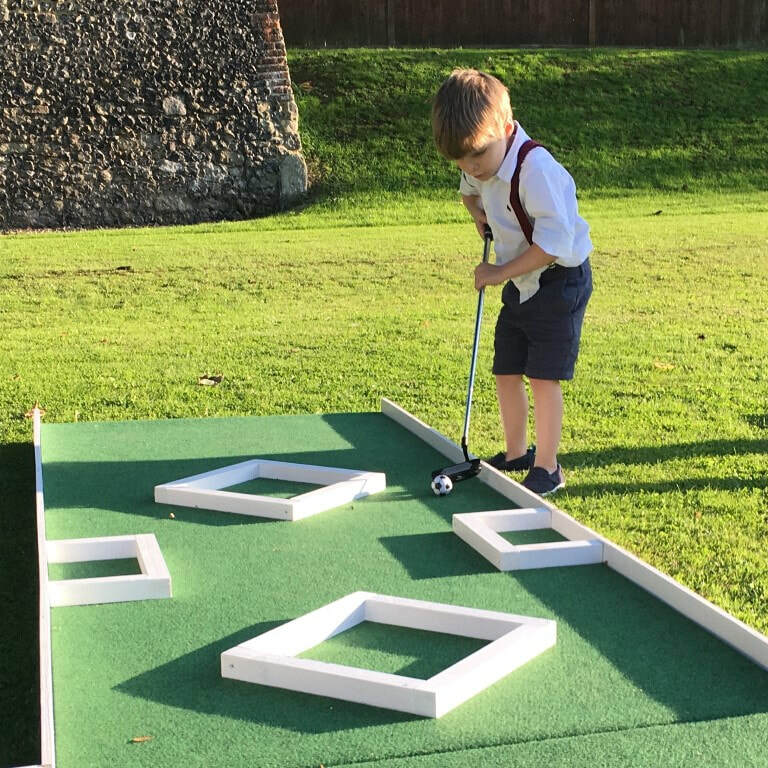 Not only do you receive nine holes, each with individual tasks to conquer, but our staff will accompany the golf courses at your venue, with our garden games hire. There will also be prizes for the winners of the day; you better start practising those swings for this unmissable event entertainment. 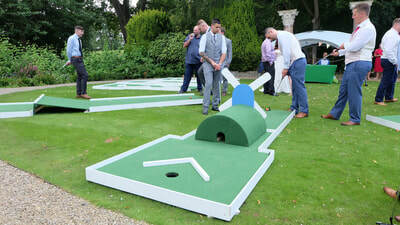 However big or small your event, we can cater the crazy golf course hire and garden games hire for any occasion. The mini golf course is available on a ‘per hole’ basis and, should you only need the one ‘hole’, we can arrange that. We can arrange the crazy golf course hire for events across the country, just drop us a message below to discuss the crazy golf course hire. 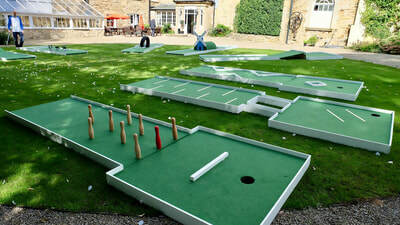 Why Your Event Should Include Crazy Golf Course Hire? ​Your huge party, or even wedding reception, deserves to be different. Forget about bands and embrace mini golf hire - your event entertainment just got crazy with our unique garden games hire. There’s nothing more fun at an event or wedding than taking on the crazy mini golf and hitting a birdie before taking on the dance floor. 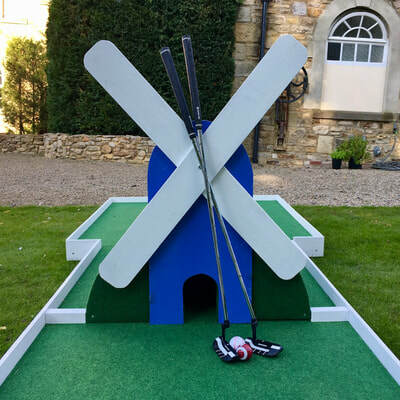 Our portable golf hire is hours of fun when it comes to event entertainment - particularly when aiming the golf ball through one of our many obstacles, including skittle bowling pins and even a windmill. Wedding activities change every year - you’ve got to stay ahead of the trends, and you can with our garden games hire. Hiring a crazy golf course for your reception is an excellent opportunity to break from tradition, and provide your guests with hours of entertainment. 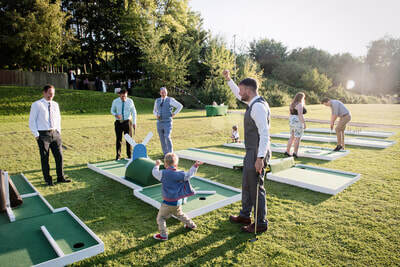 For those that may not want to dance, our crazy golf course hire is perfect for those guests to get involved and brings people together of all ages. Remember your event entertainment for years to come, and display those images proudly, with our mini golf hire for weddings and events. 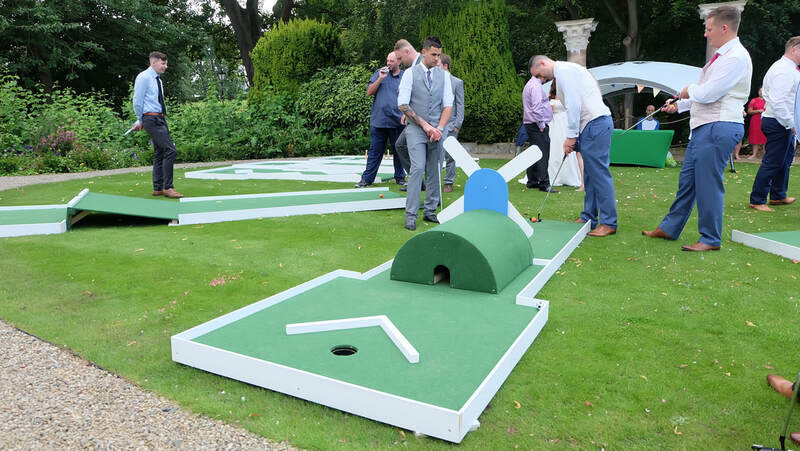 Test the Bride and Groom on their golfing abilities or create competition at your event with our garden games hire, for maximum photo opportunities. 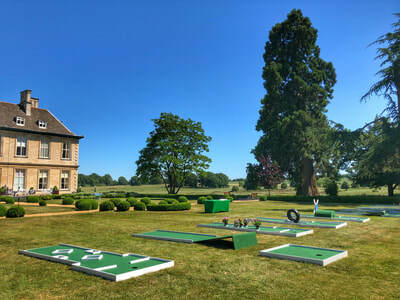 As mentioned earlier, the highly versatile portable golf courses prove an icebreaker for any networking event, or even for wedding guests who may not know each other. The fun and unique event entertainment injects a dose of competition to any occasion, allowing for guests to team up. Everyone has played a game of crazy golf and what better time to take them back to the ‘good old days’ than at your event? Ensure people talk about your function and spread the word, with a healthy dose of mini golf. We offer a variety of package deals - book multiple products to get our best pricing. Get in touch to discuss your event and how we can help. To discuss pricing for a Fun Casino package at your event simply complete our enquiry form or contact us. Please include your event date and location to ensure an accurate quote.